Animal factories pack hundreds, thousands, and sometimes millions of animals into unsanitary, inhumane, and unsafe conditions. These conditions has led to the rampant use of animal drugs, drug combinations, pharmaceuticals, and other additives to promote animal growth and suppress the negative effects that heavily-concentrated confinement has on animals. Many animal drugs are approved for use to treat animals when diagnosed with an illness, and may be necessary at times even in the most humane and sustainable husbandry systems. However, animal drugs are often also approved for non-treatment purposes, including promoting rapid growth rates and suppressing diseases in unsanitary conditions. Below are just a few examples of drugs and pharmaceuticals routinely used to prop up CAFOs. What they are used for: Beta-agonist drugs are approved for use in cows, pigs, and turkeys to boost weight gain. Why they are dangerous: They have been linked to egregious animal welfare issues, including heart stress, increased aggression, skeletal tremors, immobility, foot sloughing (literally the feet of cows falling off), nerve paralysis, increased risk of broken limbs, and spine fractures, stomach ulcers, brain lesions, blindness, respiratory problems, and higher rates of death. A beta-agonist approved for human use as an asthma treatment is linked to rapid weight gain and difficulty losing weight, demonstrating that these drugs may affect human health in similar ways. Despite these terrifying impacts on animal health, there is little independent research on their human health impacts. Beta-agonist residues have been detected on meat samples, and may pose significant risk to people with heart conditions. Specific Drugs: ractopamine, zilpaterol. Several other beta-agonists not approved for use in food animals have been detected in samples of cow and pig carcasses from animal factories, including cimaterol, clenbuterol, and salbutamol. The safety of these drugs has not been studied. What they are used for: Natural and synthetic hormones are used in beef production to stimulate rapid growth of muscle tissue. Why they are dangerous: Meats from treated animals have higher levels of hormones than meat from untreated animals. The hormones may also be carried into the environment from animal waste. The impacts from their use have not been sufficiently studied, but exposure to external hormone compounds has been linked to higher risks of cancer, developmental disorders, and endocrine disruption. Specific Drugs: estradiol, trenbolone acetate, melengestrol acetate, progesterone, testosterone, zeranol. What they are used for: A wide range of antimicrobial drugs are approved for use in cows, pigs, turkeys, and chickens to promote rapid growth and keep mortality rates lower in conditions that spread bacteria, parasites, or fungal infections. Some measures have been taken to eliminate the use of medically important antibiotics (those that are the same or similar to drugs used to treat infections in humans) for growth promotion. 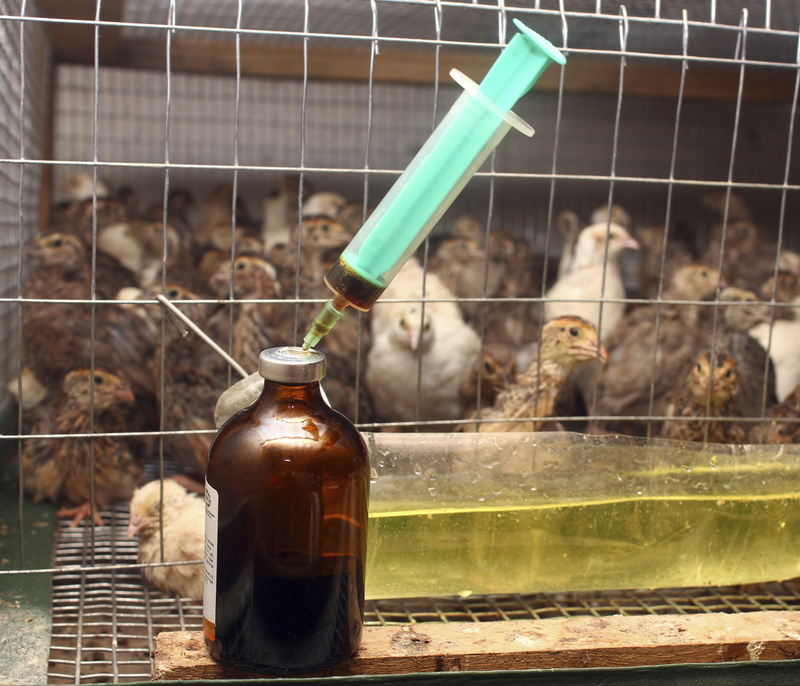 In animal factories, it is still acceptable to overuse these drugs to prevent disease in confinement conditions. Why they are dangerous: Concerns about using medically important antibiotics arose due to the public health crisis of antibiotic resistant bacteria that cause infections in humans. However, the use of any antimicrobial agent can make bacteria or other organisms resistant, and their overuse can still potentially lead to resistance to human medicine. Medically important antibiotics (still allowed for routine disease prevention): penicillin, ampicillin, tetracycline, chlortetracycline, doxycycline, vancomycin, ceftriaxone, gentamicin, kanamycin, streptomycin, neomycin, erythromycin. Other antimicrobials (allowed for all purposes): tiamulin, bacitracin, clopidol, amprolium, nicarbazin, monensin, ethopabate, zoalene, lasalocid. What they are used: Chemicals and metals may be used as feed additives for a range of purposes, including promoting rapid weight gain, increasing feed efficiency, preventing disease in healthy animals, improving digestibility of grain-heavy feeds, or keeping low-quality feeds from rotting. Arsenic, a heavy metal, was previously allowed as a feed additive to promote weight gain and kill microorganisms. Arsenic residues were widely present on chicken products reaching consumers in the U.S. in the early 2000s. CFS and other groups launched an extensive legal and public education campaign to have it prohibited by FDA. Arsenic not only has negative impacts on animals, but is connected to endocrine disruption, damage to reproductive organs, vessel disease, high blood pressure, heart disease, and diabetes, as well as skin cancer, respiratory cancers, and bladder cancer in humans. Zinc and copper, also heavy metals, are commonly used for growth promotion and disease prevention. When ingested, zinc and copper are present at high levels in animal wastes and on meat products and have been linked to an increased risk of antibiotic resistance to important medicines. Ethoxyquin, a preservative, helps extend the shelf life of animal feeds by preventing the fats from becoming rancid too quickly. FDA acknowledges the “deleterious and poisonous” effects of ethoxyquin. It was nominated for carcinogenicity testing in 1990 on the basis that it appeared to have modifying effects on the carcinogenicity of other chemicals, and yet FDA still allows its use.